The TP-588D is a dual-output receiver with PoE support for HDBaseT TP (twisted pair) signals from a compatible Kramer HDBaseT transmitter. 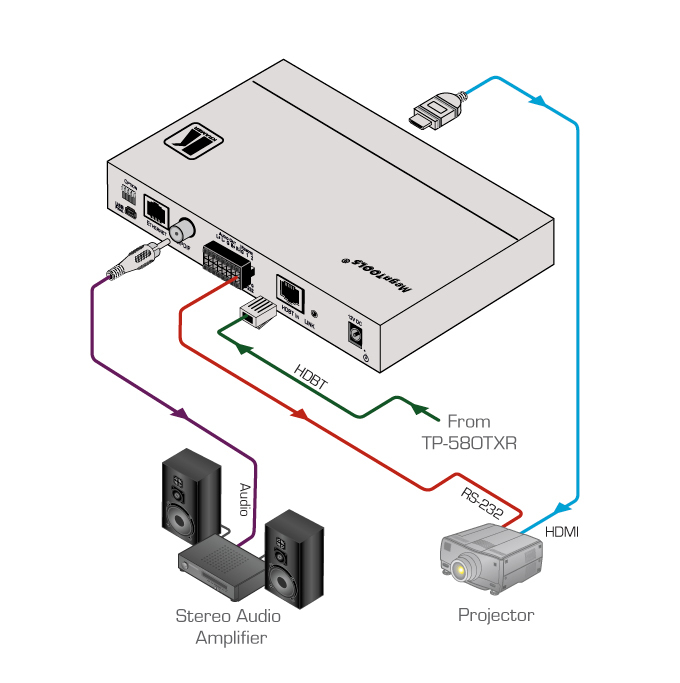 It decodes the HDBaseT into DVI, HDMI, S/PDIF, balanced stereo audio, and RS-232 signals. The device supports resolutions up to 4K@60Hz (4:2:0) UHD and is used in conjunction with any Kramer HDBaseT switcher or transmitter, for example, the WP-20, TP-580TXR or TP-780TXR. Resolution Support - Up to 4K@60Hz (4:2:0) UHD and WUXGA. Maximum Data Rate - Up to 10.2Gbps (3.4Gbps per channel). HDMI Support - Deep Color (36bpp in normal range and 24bpp in ultra mode), 3D. System Range - Up to 130m (430ft) at normal mode (2K), up to 100m at normal mode (4K); up to 180m (590ft) ultra mode (1080p @60Hz @24bpp) when using BC-HDKat6a cables. Cable - Shielded twisted pair (STP) cable recommended. For optimum range and performance use, use Kramer's BC-HDKat6a cable. Note that the transmission range depends on the signal resolution, graphics card and display used. The distance using non-Kramer CAT 5, CAT 6, and CAT 7 cables may not reach these ranges. Power over Ethernet - The receiver can operate without a dedicated power supply when connected to a device that provides PoE.